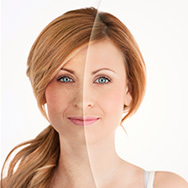 Over time, due to unprotected sun exposure and age, skin’s ability to shed the buildup of dead skin slows down. The not-too-pretty effects can be mitigated simply by adding an AHA or BHA exfoliant to your routine. And for many people, the difference is visible overnight. Apply your exfoliant after you cleanse and tone. You can exfoliate around the eye area, but not the eyelid or directly under the eye (along the lower lash line). You don’t need to wait for your BHA or AHA to absorb or dry; you can apply any other product in your routine—moisturizer, serum, eye cream, or sunscreen—immediately afterward. Experiment with different strengths of AHA and BHA to see which concentration gives you the best results. Some people do well exfoliating with AHA or BHA twice a day, whereas others find that once a day or every other day is the perfect balance. Note how your skin responds, and adjust accordingly. Exfoliating with AHA or BHA from the neck down has great benefits as well. Our Weightless Body Treatment with 2% BHA smooths the appearance of rough, red, hard, bumps on the arms and legs, and is even suitable for those with skin prone to keratosis pilaris. For incredibly smooth, hydrated skin, try our Skin Revealing Body Lotion with 10% AHA. Which Should I Use: AHA or BHA? AHA exfoliants are most helpful for dry skin with advanced signs of aging. Our AHA products smooth wrinkles and fine lines, help with rough, crepey texture, and will leave you with hydrated, supple skin and a healthy glow; research also shows them to be effective at minimizing the visible signs of sun damage. BHA exfoliants are ideal if you’re dealing with clogged pores, blackheads, blemishes, or enlarged pores, as well as signs of aging. BHA is preferred for those with temperamental skin because of its calming, soothing properties. We have products specifically formulated for easily aggravated skin, acne, as well as more general concerns. Our BHA exfoliants can reduce the appearance of small white bumps, and are even suitable for those with skin prone to milia and/or rosacea. If you’re still a bit confused about which AHA or BHA exfoliant to choose, contact our Client Service experts for a personalized skincare consultation to help you find the perfect solution for your skin! Most scrubs have rough, coarse textures, which can be harsh and abrasive, causing micro-tears in skin. The stiff bristles of many cleansing brushes have the same negative impact on skin’s vulnerable surface. Gentle scrubs and soft cleansing brushes are the exception, but even those are best used as an extra cleansing step, not as a replacement for a well-formulated AHA or BHA exfoliant. Scrubs simply don’t work as deeply or effectively as AHA and BHA exfoliants, nor do they offer the same skin-transforming benefits.